The oral fissure is immensely inhabited with a number of polymicrobial colonies similar to the intestinal system. Periodontitis is a dysbiotic disease resulting from deviation in subgingival Gram-positive bacteria to Gram-negative bacteria shift from Gram-positive bacteria. The development of periodontal dysbiosis occurs over a broadened timeframe, which slowly turns the symbiotic association of host and microbe to pathogenic. This review highlights a recent paradigm of periodontitis progression has been postulated which challenges the traditional concept of periodontitis being induced by few particular periopathogens such as belonging to red complex, but by a more comprehensive dysbiotic-synergistic community. Background: Mast cells play a crucial role in activation of acquired immune response to inflammatory conditions of periodontal diseases. 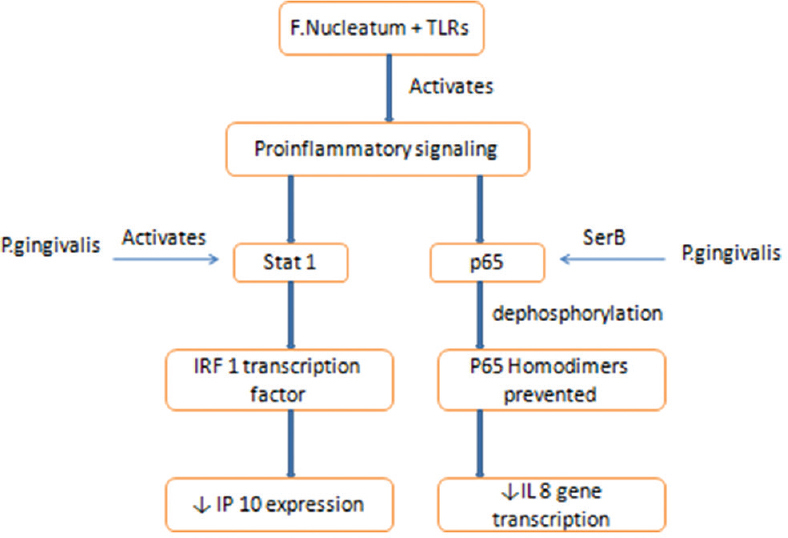 They promote inflammation by releasing pro-inflammatory mediators and bring about angiogenesis, degeneration of the extracellular matrix, and tissue remodeling. Since there is little literature regarding the role of mast cells in periodontitis, the present study was aimed to evaluate mast cell count (MCC) and density in periodontitis. Materials and Methods: A total of eighty participants, Group I (n = 40) healthy participants and Group II (n = 40) participants with moderate chronic periodontitis, were included in the study. Tissue samples of 5 micron were obtained from each participant and were fixed in 10% formalin. Inflammation assessment was carried out after staining the sections with hematoxylin/eosin (H and E) followed by toluidine blue and mast cells were counted. Results: MCC in healthy group (1.32 ± 0.43) was significantly smaller than periodontitis group (10.28 ± 1.15) and also mast cell density in healthy group (98.08 ± 37.40) was smaller than periodontitis group (803.43 ± 89.94) with P < 0.0001. Conclusions: It could be concluded that participants with chronic periodontitis have a higher MCC and density when compared with healthy participants. Context: Inflammation is a common feature of both peripheral artery disease (PAD) and periodontal disease. Aim: The aim of this study is to evaluate the relationship between PAD and periodontal disease by examining the levels of inflammatory cytokines, pentraxin-3 (PTX-3), and high-sensitive C-reactive protein from serum. Materials and Methods: A total of 50 patients were included in this cross-sectional study. Patients were divided into two groups: those with PAD (test group) and those with the non-PAD group (control group) based on ankle–brachial index values. Periodontal examinations and biochemical analysis for PTX-3 and high-sensitive C-reactive protein were performed to compare the two groups. Statistical Analysis Used: All the obtained data were sent for statistical analyses using SPSS version 18. 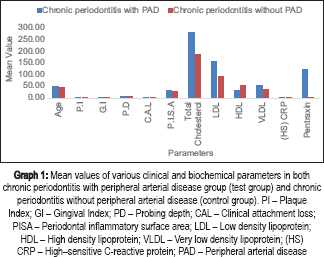 Results: In the clinical parameters, there is statistically significant difference present between plaque index, clinical attachment loss, and periodontal inflammatory surface area with higher mean values in patients with PAD having periodontitis. There is statistical significant (P < 0.01) difference in all biochemical parameters (P < 0.05) considered in the study between PAD patients and non-PAD patients with higher mean values of total cholesterol (TC), low-density lipoprotein (LDL), high-sensitive C-reactive protein (hs-CRP), and PTX-3. Conclusion: PTX-3 and acute-phase cytokine such as hs-CRP can be regarded as one of the best indicators to show the association between the PAD and periodontitis followed by hs-CRP, TC, very LDL (VLDL), and LDL. However, high-density lipoprotein (HDL) is a poor indicator for its association with chronic periodontitis and PAD. Background: Tumor necrosis factor-alpha (TNF-α) is indicated to play a major function in chronic inflammatory disorders. Objective: To assess and compare the cytokine level (TNF-α) in the serum of chronic periodontitis (CP), rheumatoid arthritis (RA), RA with CP, and healthy volunteers. Materials and Methods: This original research was carried out on 80 participants, divided into Group-I 20 RA patients, Group-II 20 CP patients, Group III 20 RA with CP (RA + CP), and Group IV 20 healthy volunteers. Clinical periodontal and rheumatological parameters were assessed in all the four groups. Blood serum samples have been collected from all individuals and investigated for levels of TNF-α by mean of enzyme-linked immunosorbent assay. Results: TNF-α level were remarkably elevated in the RA+CP group (30.5±2.2) followed by RA group (17.9 ± 3.6), and CP group (11.9 ± 0.96) when compared with the controls (5.5 ± 3.3). The results showed a statistical signifi cance of P < 0.001. Correlation was not observed on comparision of clinical periodontal parameters and Rheumatological parameters with TNF-α levels. Conclusion: The outcome of this present research revealed the presence of higher levels of TNF-α in individuals with RA with CP in our samples. 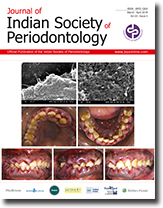 Aims: The aim of this study was to observe the sequelae of fenugreek adjunctive to nonsurgical periodontal therapy and its comparison to a group treated with scaling and root planing (SRP) and metformin alone by assessing their respective effects on periodontal parameters, glycemic status, and serum lipid levels. Materials and Methods: The study comprised eighty patients who were further divided into two groups. Each group consisted of 40 patients. Group 1 consisted of uncontrolled noninsulin-dependent diabetes mellitus (NIDDM) patients with chronic generalized periodontitis, who received SRP and treatment with metformin. Group 2 consisted of uncontrolled NIDDM with chronic generalized periodontitis, who received SRP and metformin plus fenugreek powder. Periodontal parameters such as gingival index, plaque index, bleeding on probing, pocket depth, and clinical attachment levels were evaluated before treatment and 1 month after nonsurgical periodontal therapy. The values of low-density lipoprotein (LDL), triglycerides, total cholesterol (TC), and glycosylated hemoglobin (HbA1c) were assessed by collecting the blood samples before treatment and 1 month after treatment. Results: There was a statistically significant change in all the parameters seen clinically in both the groups. The glycemic status also showed a statistically significant reduction for fasting blood sugar (P < 0.001) on intragroup comparison. Intragroup comparison shows a statistically significant reduction (P < 0.001) for serum lipids, whereas intergroup comparison showed a statistically significant reduction after treatment only in TC and LDL levels (P < 0.02 and <0.012). Conclusion: This study shows that fenugreek powder can be used adjunctive to SRP to control the glycemic status and serum lipid levels in uncontrolled NIDDM patients. Background: Dental implant is a method to replacement of missing teeth. It is important for replacing the missed anterior teeth. In vitro method is a safe method for evaluation of stress distribution. 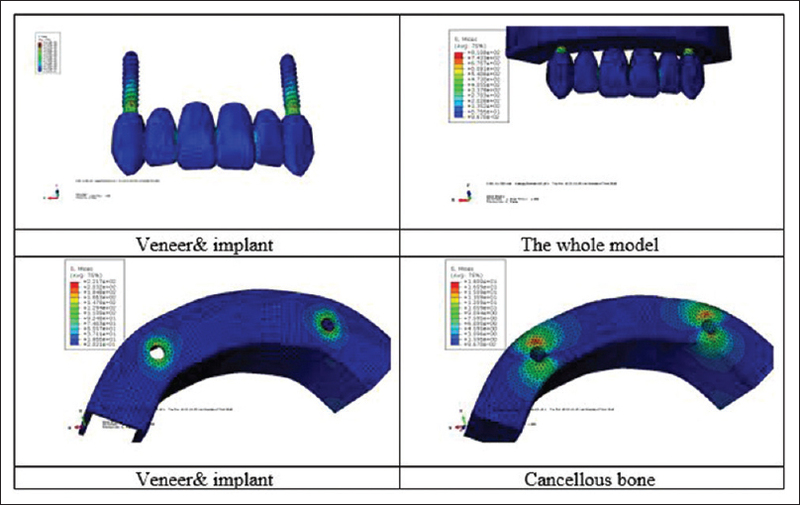 Finite element analysis as an in vitro method evaluated stress distribution around replacement of six maxillary anterior teeth implants in three models of maxillary arch. Materials and Methods: In this in vitro study, using ABAQUS software (Simulia Corporation, Vélizy-Villacoublay, France), implant simulation was performed for reconstruction of six maxillary anterior teeth in three models. Two implants were placed on both sides of the canine tooth region (A model); two implants on both sides of the canine tooth region and another on one side of the central incisor region (B model); and two implants on both sides of the canine tooth region and two implants in the central incisor area (C model). All implants evaluated in three arch forms (tapered, ovoid, and square). Data were analyzed by finite analysis software. Results: Von Mises stress by increasing of implant number was reduced. In a comparison of A model in each maxillary arch, the stress created in the cortical and cancellous bones in the square arch was less than ovoid and tapered arches. The stress created in implants and cortical and cancellous bones in C model was less than A and B models. Conclusions: The C model (four-implant) reduced the stress distribution in cortical and cancellous bones, but this pattern must be evaluated according to arch form and cost benefit of patients. 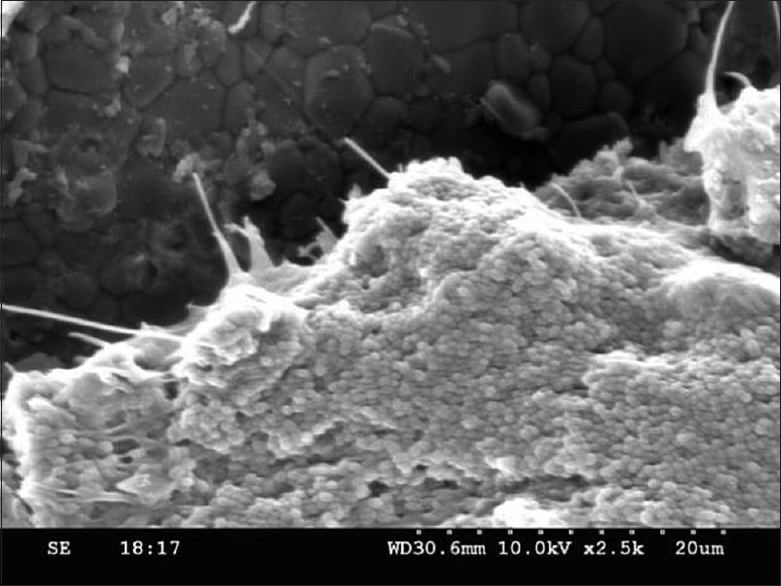 Context: Biofilms are known for their antimicrobial resistance, and so is the subgingival plaque biofilm, the primary etiologic factor for periodontal infections. Aims: The objective of this study is to investigate if the subgingival plaque biofilm resistance can be reduced using doxycycline in the presence of low-intensity electric field (bioelectric effect). Settings and Design: The study was an in vitro microbiological study. Materials and Methods: Subgingival plaque samples from chronic periodontitis patients were collected to grow subgingival plaque biofilms on hydroxyapatite disks. Hydroxyapatite disks with the plaque biofilms from each patient were divided into four groups: (i) No intervention – control, (ii) current alone – CU; (iii) doxycycline – AB, and (iv) combined treatment – CU + AB. After respective treatments, the disks were anaerobically incubated for 48 h, the biofilm was dispersed and subcultured and colony-forming unit/mL was estimated in all the four groups. Statistical Analysis: Statistical analysis was done using Mann–Whitney and Kruskal–Wallis tests for intergroup comparisons. T-test was done to assess the difference in current flow between the groups CU and CU + AB. Results: All the three treatment modalities showed antibacterial effect. Application of current alone resulted in reduced bacterial growth than control group. Doxycycline alone resulted in reduction in bacterial counts better than control and current alone groups. The combination treatment showed greatest inhibition of bacterial colonies. Conclusion: The ability of doxycycline antibiotic in inhibiting plaque biofilm was significantly enhanced by application of a weak electric field (5 volts for 2 min). Aim: The present investigation aimed to evaluate root coverage (RC) with periosteum eversion technique (PET) using periosteum as a graft and coronally advanced flap (CAF) with platelet-rich fibrin (PRF) membrane as a graft in the treatment of isolated Miller's class I and II gingival recession defects. 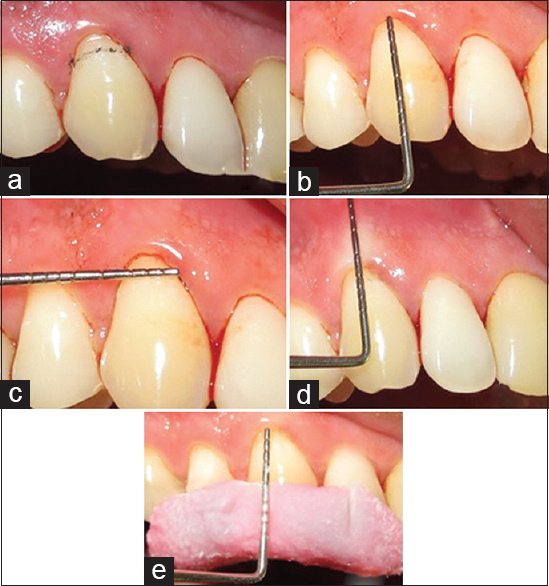 Materials and Methods: Thirty sites in 15 participants with Miller's Class I or II gingival recession were randomly treated either with PET using periosteum as graft and CAF + PRF as graft. In a split mouth design, the parameters such as recession depth, recession width at cementoenamel junction, probing depth, periodontal attachment level (PAL), and keratinized gingival width were assessed at baseline, 3 months, and 6 months postoperative follow-up with William's graduated probe and Vernier caliper. Results: Both the treatment modalities yielded statistically nonsignificant desirable treatment outcomes at both postoperative levels in terms of all the parameters The mean RC with probe method and Vernier method in CAF + PRF was 75.01% and 86.86%, respectively, and PET showed a mean RC of 61.112% and 83.971%, respectively, at 6-month interval period which showed a nonstatistically significant difference. Conclusion: Both the treatment modalities, i.e., CAF + PRF and PET are essentially and equally effective in the treatment of Miller's Class I or II gingival recession defects. Background: The platelet concentrate is a windfall in the field of regenerative therapy in periodontology. It accelerates wound healing by excellent neovascularization and promoting fast cicatricle tissue remodeling. Aim: This study aims to evaluate clinically and histologically accelerated effect of platelet-rich fibrin (PRF) membrane and PRF matrix (PRFM) following depigmentation procedure. Materials and Methods: Eleven individuals were divided into three groups after depigmentation procedure. PRF membrane and PRFM gel were prepared as per standard protocol. Group A and B received PRF membrane and PRFM gel followed by periodontal dressing, respectively, and the only periodontal dressing was placed in Group C. The individuals were evaluated for visual analog scale (VAS) and healing index (HI) on 3rd and 5th day. Epithelization test and histologic analysis from punch biopsy were done on the 5th day. At 3rd month, reevaluation was performed. Results: The intergroup statistical analysis in respect to VAS, HI, epithelization test, and histologic analysis showed a statistically significant results with P < 0.001 in Groups A and B compared to Group C. Clinical evaluation of epithelization test and histologic analysis revealed better-wound healing and moderate to no inflammatory cell infiltrate in Groups A and B, respectively, as compared to Group C, which appeared more erythematous with dense inflammatory cells. Conclusion: Thus, the application of PRF membrane and PRFM gel has shown a successful approach to protect the raw wound area of depigmented sites with better patient comfort and faster healing. Background: Postsurgical root sensitivity has always been an enigma to the periodontists. There is a plethora of evidence suggesting the presence of root sensitivity following periodontal flap surgical procedures. Thus, the aim of the present study was to compare and evaluate the effect of low-power diode lasers with and without topical application of stannous fluoride (SnF2) gel in the treatment of root sensitivity and also evaluate whether laser creates any placebo effect in the control group or not. Materials and Methods: Thirty patients participated in this study and 99 teeth were included. Root sensitivity was assessed for all groups with a Verbal Rating Scale (VRS). For each patient, the teeth were randomized into three groups. In the test Group I, sensitive teeth were treated with SnF2and diode laser. In the test Group II, sensitive teeth were irradiated with laser only. In the control group, no treatment was performed. Results: The mean ± standard deviation (SD) score for VRS and Visual Analog Scale at baseline was not statistically significant (P > 0.05) between the three groups. After 15 min, statistical significant difference was seen in test Group I and test Group II, although no difference was found in the control group. At 15th day and 30th day, the mean ± SD scores were statistically significant (P < 0.05). Conclusion: Within the limitations of the study, it can be concluded that diode lasers alone and in combination with 0.4% SnF2was effective in the treatment of root sensitivity after access flap surgery. Objectives: The gingival and periodontal changes during pregnancy are well known. Gingivitis is the most prevalent oral manifestations associated with pregnancy. The hormonal and vascular changes that accompany pregnancy are known to exaggerate the inflammatory response to the local irritants. Hence, a study was designed to assess oral hygiene status, gingival status, periodontal status, and treatment needs (TNs) among pregnant and nonpregnant women. 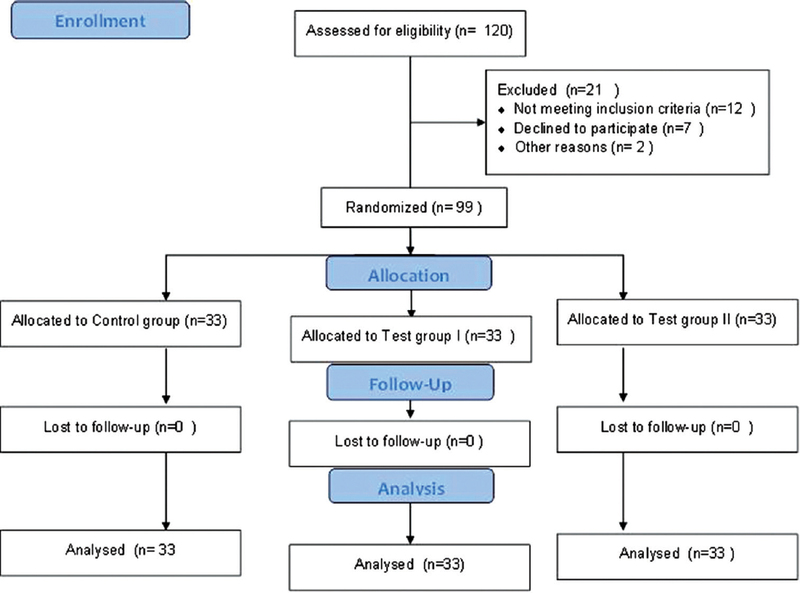 Materials and Methods: A cross-sectional study was conducted among 120 pregnant and 120 nonpregnant women of 18–44 years age attending the Outpatient Department of Gynaecology and Obstetrics in Government Hospital of Belgaum city, Karnataka, India. The study consisted of an interview and oral examination. Type 3 examination was followed. Simplified Oral Hygiene Index (OHI-S), Gingival Index, and Community Periodontal Index and TNs Index were used to assess “oral hygiene status,” “gingival status,” and “periodontal status and TNs,” respectively. Results: The pregnant women showed poor oral hygiene with the mean OHI-S score as 2.68. Gingivitis was prevalent in almost all the pregnant and nonpregnant women. However, it was found more severe in pregnant women with mean gingival score as 1.25. A definite increase in gingivitis was found from Trimester II to Trimester III. The mean number of sextants showing healthy gingiva was significantly (P < 0.01) lower among pregnant women. Conclusions: Pregnant women showed poor oral hygiene, more gingival inflammation, and more periodontal disease as compared to nonpregnant women. The severity of gingivitis increased in Trimester III. Proper oral hygiene practice can prevent these diseases and further complications. Acute myeloid leukemia (AML) is a malignant neoplasm of myeloid series defined by the presence of immature blast cells (<30%) in peripheral circulation. Oral manifestations are the potential indicators of systemic health and disease. Oral cavity is the frequently and early involved sites in AML. Gingival overgrowth due to leukemia is one such condition encountered by periodontists. Hence, understanding, identifying, and correlating oral manifestations with systemic diseases are the ultimate responsibility of every dental clinician because of its lethal and unpredictable course. In the present case, we are discussing an undiagnosed case of AML who presented to us with oral complaints. Pyogenic granuloma (PG) is a reactive hyperplasia of connective tissue that occurs in response to low-grade local irritation, traumatic injury, foreign materials, or hormonal causes and rarely associated with bone loss. Although solitary PG is a common lesion in the orofacial region, presence of multiple such lesions at the same time with associated bone loss is rare. In addition, repeated recurrences of such lesions sometimes frustrate the clinician. 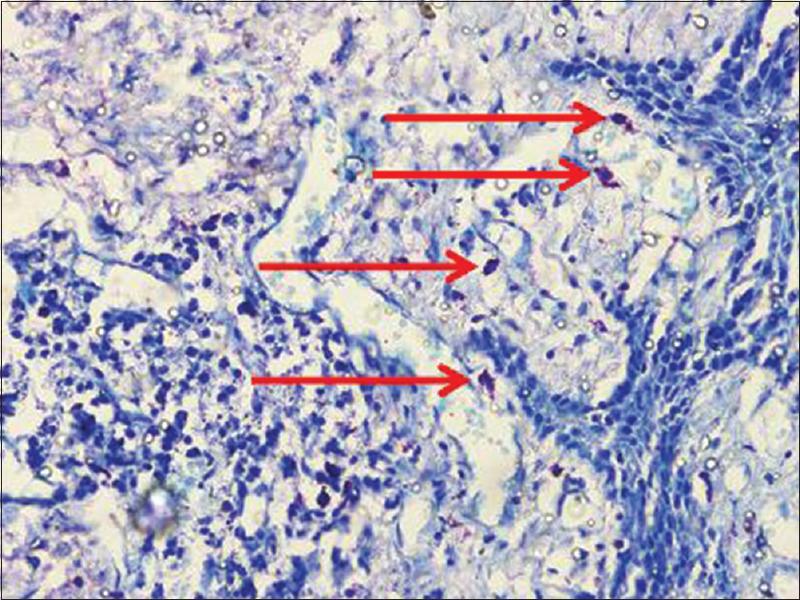 This article presents a rare case of simultaneous occurrence of PG at multiple sites associated with bone loss in a young female and its management. Tuberculosis (TB), a common chronic-specific granulomatous disease, has become rare in the developed countries. However, it is still a common cause of morbidity and mortality in India. Although it commonly involves the lungs, its presentation in the oral cavity is quite uncommon. The very rare incidence of primary gingival TB, particularly in the absence of active pulmonary involvement often leads to misdiagnosis. 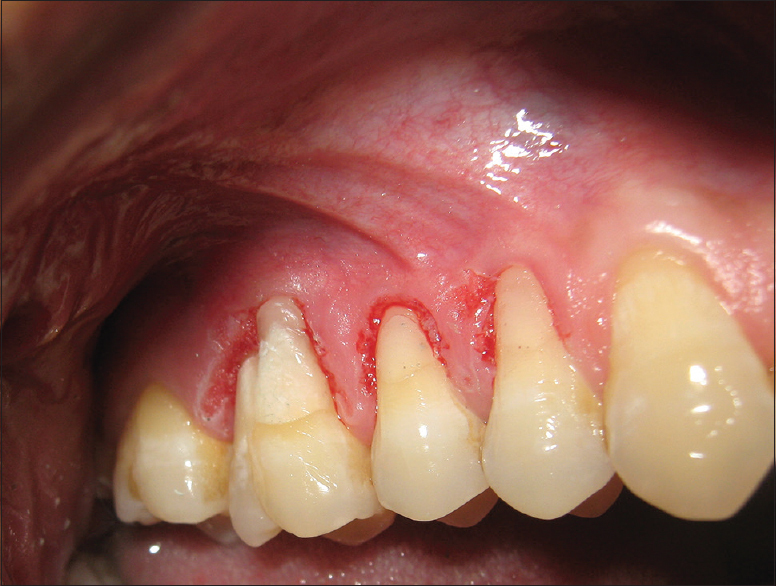 Clinical features of oral lesions may include ulceration, nodules, granulomas, and fissures. TB in pregnant women is a major cause of obstetric complications and increased risk of maternal and child mortality. 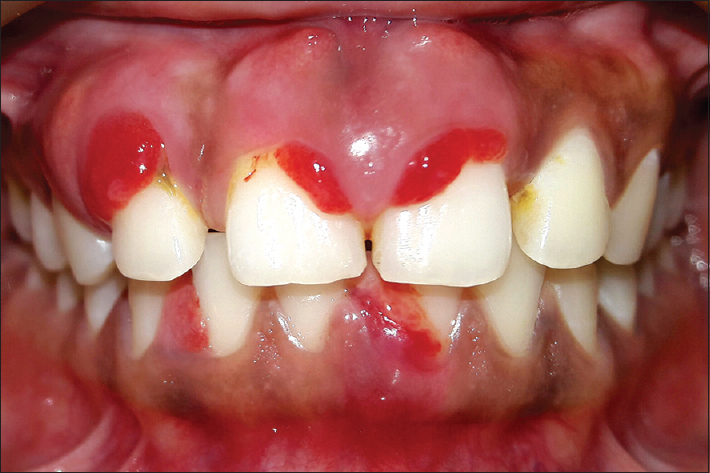 This report highlights a rare case of primary TB of gingiva, presenting as severe gingival overgrowth in a patient with 4th month of pregnancy. 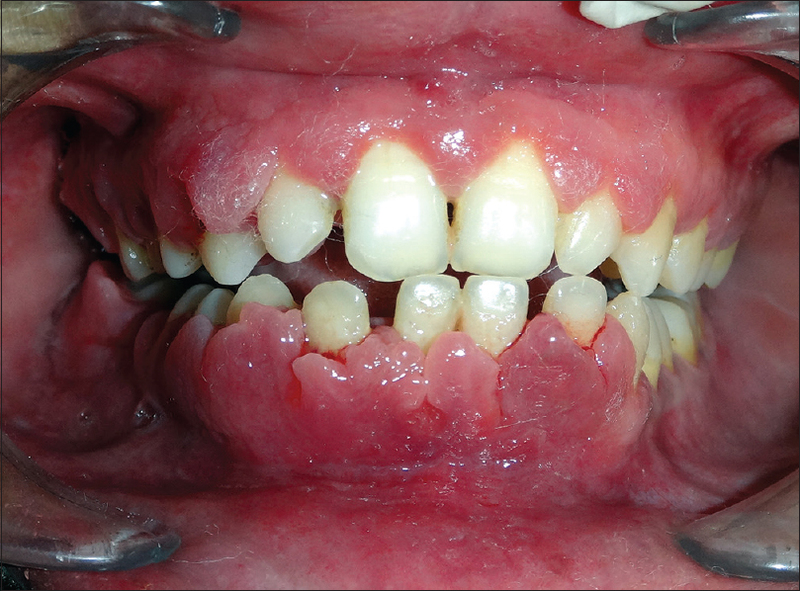 This case strongly suggests the importance of suspecting TB as the differential diagnosis of gingival overgrowth and therefore, playing a critical role in the early detection and treatment. Interdisciplinary collaboration for diagnosis and management resulted in the successful outcome and prevented the obstetric complications in this case. A patient was reported with Class II gingival recession (GR) of 5 mm. After restoring abrasion with glass ionomer cement, a full-thickness flap was raised and using blunt dissection through the buccinator and loose surrounding fascia buccal fat pad (BFP) was exposed into the mouth. It was easily spread over the maxillary roots of 14, 15, and 16. It was secured and immobilized using sutures. Postoperatively, the patient did not report swelling or trismus. At 3-year postoperative, gingival margin was at cementoenamel junction, stable and healthy and did not show any recession. Thus, it can be concluded that BFP for covering GR is an excellent technique. It is simple surgical procedure with easy handling of the flap. It provides excellent color and texture match and can also be considered as an excellent procedure for increasing the width of attached gingiva.